ViaAqua, which is generally a lower cost/lower quality product, actually produces a great air pump. While it may only last around one and a half years before it shows signs of wear, it will run much more quietly than a Tetra Whisper. Seeing as the air pump will be the most noisy component of the tank, this is a huge factor. Because the pump is so cheap I highly recommend it for anyone in need of an air pump with a tank under 90 gallons. Setting up the ViaAqua Million Air Pump is quick and easy. The cord is a nice 6 footer, meaning you can place the pump wherever you like and coil the left over up. Air pumps do best when placed above the tank, as this reduces pressure and prevents reverse siphons. Be sure to use all of the outlets on the pump. Unused outlets will create a fair amount of back pressure, making the pump significantly louder. Likewise having one output under much less pressure will have the same effect. Remember the 80 and 200 models have one output while the 400 and 600 have two. Each pump, except for the 80, comes with a flow control knob on the back of the filter, however the valve does not restrict the flow too much. If you would like a much lower flow you will need to add a flow control valve. These can be found at most stores in the U.S. for 80 cents to a dollar. Try not to use excessive tubing, as this will also increase the pressure on the pump. I had the best results with leaving just a few extra inches on my tubes, allowing the air stone a bit of freedom. Too little tubing and they kept coming to the waters surface, making a foamy bubble noise. If you order a pump from amazon do not throw the box out! Instead drill/cut a small hole in it on both sides. Place the pump inside the box, with the tube and cord going through the holes, and seal it shut for a noise reducing barrier. I did this with both the pumps box and amazons box, all underneath a towel. This became so quiet I couldn’t hear the pump even with the cabinet door open. Some owners will try to cut corners on the previous method, simply wrapping the pump in a towel. This will cause the pump to heat up, shortening the lifetime of the pump. The box set up only takes a few minutes longer so please give it a try. It may even save you the trouble of having to buy a new quiet pump in the first place! After running for a few months, air pumps can create a few issues. Despite the rubber footing, air pumps will still move around. Ensure they are not against any surfaces so the vibration does not transfer. The vibration will also produce a fair amount of heat. Avoid covering the pump if possible. Securing the pump in place with holes in the stand is helpful. Mine is held in place by the silicone tubes in the box set up. After a few months the screws may be vibrated loose, creating a rattling noise. Tighten the screws if you think this has happened. Dust can create unwanted heat, shortening the pumps life. Dust it off every once and awhile if it is uncovered. Air stones, bubble wands and air tubing can all deteriorate. Combat this by having two sets of air stones/bubble wands. Clean one and allow it to rest and dry for a month before swapping the two and repeating the process. Remember no soap! The ViaAqua Million Air Pump should last over two years if you take all the steps above to reduce pressure, one year if you don’t. This isn’t too long but certainly more than enough for the low price point and quiet operation. The pump is covered by a one year warranty from any and all manufacturers defects. This does not cover any damages caused by the user, such as reverse siphons, drops or attempted repairs. The pump must be returned and be accompanied by $10 for shipping and handling. Overall it is far less hassle to just buy a new air pump. This entry was posted in Equipment, Pumps on May 20, 2018 by Joshua@themandaringarden. 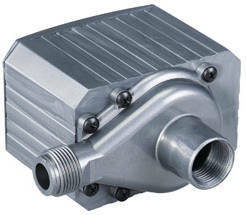 The Tunze Silence Recirculation Pump offers a great balance of price and performance. It runs virtually silent, pushes water at a reliable rate with decent heads to suit most tanks needs. There is also the lower power draw, which makes the pump heat the tank less. The extended legs on the suction cups help cut down what is left of the vibrations. All but the Silence Pro offer variable performance and are plug-compatible with PVC pipes. All but the Silence Pro 1073.110 come with a 2.2 meter cord, while the Silence Pro comes with a 3 meter cord. Each pump will operate on a 230V/50Hz voltage/frequency. They also come equipped with a safety thermostat, which prevents the pump from damaging itself at high temperatures. For the standard silence models press the suction cups into their openings on the bottom of the pump and turn them (1). Once turned the suction cups should be completely sealed. Next you will need to pick which hose support you will be using. Refer to the table at the top for the outputs size, listed under hose. Screw the support on clockwise until it stops (2). The performance of the pump can be adjusted using the dial on the front of the pump (3). The pump will be louder during its first week of operation. Give it time to settle. For the Silence Pro the instructions are the same, using pictures 4, 5 and 6 for reference. While this applies to all pumps, proper tubing is important to keep any pump safe and quiet. Be sure to fix the tubing as securely as possible, giving it stress tests before filling it with water. Additionally keep the tube as free from contact as possible if it will be hanging free. Loose tubing can cause a fair amount of noise if only one part of it touches your tank or stand. For my tanks, quieter is better. To do this I keep the pumps fully submerged. While these pumps can be used externally, I find this increases their volume. Remember: Water pumps are not meant to run dry. Ensure the pump will always be receiving water. Failure to do so will cause increased wear on the pumps parts and make it dramatically louder. Only plug in the pump once it has a supply of water. This is perhaps one of the easiest to disassemble pumps I have worked with. To begin remove the suction housing grate (1) and turn the housing locking bar counter clockwise to remove (2). Remove the impeller cover and slide out the impeller to finish. You can then clean out each part individually. Be sure to only use soft, non abrasive materials on the impeller and its mounting drive. These parts are magnetic, meaning any small scratches will severely impact the performance of the pump. Re assemble the pump in reverse order to complete. Tunze offers a two year warranty on the Tunze Silence Recirculation Pump. Tunze themselves offer great customer service, so expect the support to last much longer than the actual warranty. Just be sure to keep proof of purchase, which can be a receipt online or physical paper. Tunze’s propeller based products will often last over a decade of use when cleaned regularly, and the Tunze Silence Recirculation Pump is no different. Just remember to be careful with the impeller, as it is ceramic and easily the most fragile part of the pump. Looking for more information on quiet aquarium water pumps? Read our full guide here. 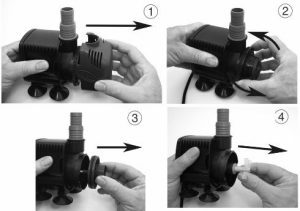 The Tetra Whisper is the common starting point of most aquarists air pump, and for good reason. It is consistently quiet, when properly set up, and comes at a very friendly prices. It brings a lot of power, often too much for beta fish owners, and offers a two year warranty. The two smaller size have a single output while the two larger sizes have two outputs. This is important as not using both outputs will result in a much louder air pump (Explained In Set-up). Like most air pumps, the Tetra Whisper is plug and play. There are however plenty of tips for the best air pump set up. First you will want to use all the outputs. By leaving one open you create excessive back pressure, which will generate a lot of noise. Similarly try to use only as much tubing as needed, as the extra travel time will also increase back pressure. Additionally the pump will perform more quietly when placed above the tank. This creates an optimal set-up, allowing the pump to run with as little resistance as possible. If you have no where to store the pump above the tank, placing the pump below the tank is fine too. Pumps placed below the water line will need a check valve to prevent any reverse siphons. Depending on the size of your air pump you will need to adjust your air stone/outputs. Limiting the outputs will make the pump much more noisy, making large air stones essential for larger pumps. Be sure to keep the air stones clean, as trapped debris will also add unwanted pressure. The pump does not have a flow control valve, however you can add your own inline valve for about $1. If you wish to power more objects the tetra whisper does work well with T-valves or gang valves. If you own betta fish this will almost certainly be a requirement as the whisper can be overpowering fro slow swimmers. Finally the noise can be cut down further by placing the pump inside of boxes. I used the amazon box that the pump came in as well as the tetra box. By cutting small holes and surrounding them with silicone I created a sound muffling box set, only supplying a bit of my own silicone. You can get a similar result without it but I like my devices super silent. Some Whisper owners will advise you wrap the pump in a towel. This did not help too much with my own pump and trapped a lot of heat. I do not recommend keeping your pump like that, as it will shorten the lifespan of the rubber components. The constant vibration can loosen the screws, increasing the noise generated by the pump. Try and tighten them if you notice increased volume. The pump may move due to vibrations, allowing the pump to find a much louder home. Securing the pump in place with holes in the stand is helpful. Mine is held in place by the silicone tubes. Dust can create unwanted heat, shortening the pumps life. Dust it off every once and awhile. Air stones, bubble wands and air tubing can all deteriorate. Combat this by having two sets of air stones/bubble wands. Clean one and allow it to rest and dry for a month before swapping the two and repeating the process. The Tetra Whisper should last between one and three years, with many users going well beyond that. If you take advantage of all of the above listed tips for reducing pressure then your pump should exceed the normal lifetime. The main component that breaks is the rubber diaphragm. This can be replaced, however the shipping and cost is about the same as a new pump. The Tetra Whisper comes with a two year warranty, however their responses are a bit slow. I recommend keeping a back up air pump, perhaps a second whisper as they are so cheap, so that your tank does not have to go without aeration for too long. Supreme Mag Drives utility pump is one of the most frequently recommended pump in the aquatic community. It has the ability to push water at an amazing rate, maintaining the flow rate at higher heads than most other pumps. The Supreme Mag Drive model 2, 3, 5 & 9.5 all have higher gph than listed while the other models run slightly lower. While this may seem deceptive at first, the company has put out an easy to read size chart. Nominal is the gph listed on the box. With some quick measuring you can easily find the pump that matches your exact needs. There isn’t much to do here. The pump comes fully assembled with no method of attachment included. This means the pump will be resting on its body. As you may have guessed, this produces a fair amount of noise. Take a note from Tunze and place a few rubber holders between the pump and its resting spot. I use my pump inline, which allows me to use old cup coasters as padding. In general the more surfaces you use the quieter the pump will be. Just be sure that the pump is held at an even level so that it does not fall. Even after the pump has been muffled it will still produce a fair amount of noise. When submerged this is less of an issue, but the pump generates heat. This can be a big issue for those without chillers. For this reason the pump is often used only for outdoor ponds or in soundproofed cabinets. A good note is the 10 foot power cord. This allows Mag Drive to be placed almost anywhere. Just remember the pump is fairly big and will need tubing. My main issue is that the pre-filter shown in the manual is not included with the pump. Instead only the foam pre-filter is provided. This can keep a lot of the debris out of your pump, however it will not protect any fish. For this reason I cannot recommend this pump for in tank use without adding on the pre-filter attachment. Cleaning the pump is quick and easy. Only the front cover and impeller are intended to be removed. You will need a Phillips head screwdriver for this. Once they are removed you can soak the impeller in a 50/50 mix of water and vinegar solution for 20 minutes while you clean out the rest of the pump. Remember to completely remove any buildups, especially if you are using the pump for saltwater. Rinse off all the parts and reassemble in reverse order. Ensure all tubing is secured before restarting the pump. The flow is where this pump absolutely shines. Even over long heads the pump can maintain a high gph rating. Most pumps will peter out well before the Mag Drive. However you cannot adjust the flow rate without adding an additional valve. Be sure to pick the right size to avoid any complications. There is a limited 5 year warranty covering the Mag Drive utility pump. It covers the body, cover, filter and its accessories. This does not cover the impeller, which has a much shorter 11 year warranty covering it. As the impeller is the most likely part to break, this is fairly frustrating. Luckily it is fairly cheap to replace once the warranty ends. When using the warranty to repair or replace many of the pumps parts you will be asked to cover a $5 shipping fee. Nothing too big but you would expect the warranty to cover that. Most Mag Drives will live to see over 5 years of use. Many of the older models have lived past the 10 year mark and not much has changed since the original design. If you are willing to replace the impeller a few times you can easily see over 10 years from this powerful pump. The Mag Drive 9.5, 950 gph utility pump is one of the most universally accepted pumps in the aquatic community. While its noise factor is above average, so is the flow rate. Even when climbing a significant head the Mag Drive 950 gph pump manages to keep a decent flow going. For outdoor pumps and sound proofed cabinets, there is no better choice than the Mag Drive utility pump. 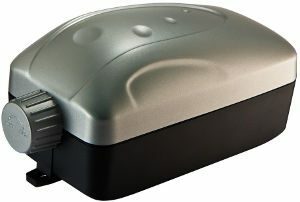 The main issue when setting up the Mag Drive 950 gph pump is keeping it quiet without heating your aquarium. When submerged this model will create a fair amount of heat, raising the water temperature a few degrees. This can be a good thing for colder areas and an absolute nightmare for warm places like mine. If you cannot have any heat generation in the water you will need to run the pump externally. To run the Mag Drive 950 gph pump externally you will need to fit the intake with a second tube. 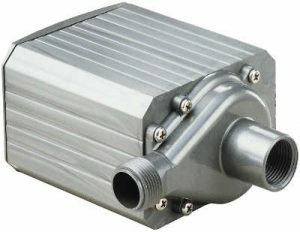 The intake has a 3/4″ female pipe thread(FPT) while the output is a 3/4″ MPT. When positioning the pump you should think about sound generation. Even if you are using this for an outdoor pond you will not want to hear the pump. I have found that using four rubber holders will reduce the sound dramatically. You can also hide the pump in a box to reduce the noise, however this can trap a lot of heat and damage the pump. The power cord is a solid 10 feet long, which allows you to place this pump pretty much anywhere. Ensure the cord doesn’t run into any high traffic areas. If it runs along the grass I recommend placing a flag beside it as a reminder when doing yard work. While only one part, two if you buy the pre-filter attachment, comes off of the pump, it is more difficult than most to open. You will need a Phillips head screwdriver to open the body up. Once the cover is off you can remove the impeller and clean out the pump. This should be done every 1-3 months, depending on what conditions the pump is running in. The less stressful the environment, the less important cleanings will be. The impeller should be soaked in a mixture of 50% water 50% vinegar for no less than 15 minutes. This will remove most buildups without damaging the impeller via tough scrubbing. Rinse off all of the components before reassembling. Ensure all tubes are secured before starting the pump. The flow rate cannot be adjusted without moving the pump or adding on a throttle valve. For my tank this turned out to be essential as I needed a very specific gph. The Mag Drive 950 gph pump actually puts out a bit more force than advertised. This is a big plus as all pumps lose power when climbing any vertical distance. The Mag Drive 9.5 is one of the best at maintaining its power when climbing, which is why it is one of the most popular models available. The Mag Drive 950 gph pump comes with a 5 year limited warranty. This covers all non moving parts of the pump. The moving parts are covered under a separate warranty that lasts for one year. This is a bit frustrating, as these parts are far more likely to break than the rest of the pump. When well cared for most owners will see the pump lasting well over 6 years, often stretching into a decade. This, however, will often require replacing the impeller a few times. While this is relatively cheap you should still factor the cost of 1-3 new impellers to the overall cost. This entry was posted in Equipment, Pumps on May 18, 2018 by Joshua@themandaringarden. The Mag Drive 500 gph utility pump is one of the most cost efficient models of the series. It comes at a moderate price, brings a decent flow while still keeping the more practical body shape. There isn’t a whole lot of set up involved with this pump. You will first need the right size tubing. Both the inlet and outlet sizes are 1/2″, with the inlet being FPT and the outlet being MPT. Unlike the larger models, the Mag Drive 500 features a flat base for the pump to stand on. This is in no way sound reducing, but it does make quieting the pump a bit easier. Placing a rubber mat underneath the pump will often be enough to reduce the noise. If you can, submerging the pump will reduce the noise immensely as opposed to running it externally. This will also reduce the over all tubing required. The issue here is heat generation. When fully submerged the Mag Drive has a bad habit of raising the waters temperature a few degrees. If you have a small tank/body of water this could be trouble. Despite being one of the smaller sizes, the 500 gph model still comes with a 10 foot cord. This is actually too much cord for my indoor use. You can keep a lot of the cord coiled while using the pump, but do not excessively bend it. This can damage the wires. To open the pump you will need to unscrew the four screws located around the intake of the pump. They require a Phillips head screw driver to remove. With the front cover gone you will have access to the impeller. Unlike larger models, the impeller is magnetic rather than ceramic. In my opinion this is great, as ceramic shafts always break much easier. Remove the magnetic impeller and submerge it in a solution of 50% water and 50% vinegar. Leave the impeller soaking for at least 15 minutes. The body can be scrubbed clean with whatever you have on hand. Try to avoid any materials that have been exposed to cleaning agents or other chemicals. 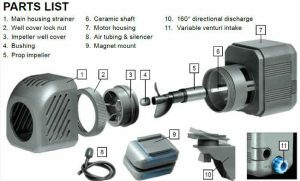 Both the impeller and its magnetic mount must be cleaned using soft, non abrasive materials. Any scratches here will cause irregular spinning. This creates uneven water flow while damaging the impeller until it breaks. I personally use cotton swabs on my magnetic impellers, as they can still scrub hard enough to remove debris without scratching. Keep in mind there is absolutely no way to control the flow without installing an additional valve or adding more/less head(vertical height). While the pump may be small, it can still surprise owners with its powerful flow. The table above shows why I absolutely love this model. Its strength is well above what is listed. After climbing a few feet it can still hold a lot of power. Mid sized tanks can easily see a 10 times turnover rate with this pump installed in their sump. After switching out my old rio aqua(old for a rio anyways) I immediately saw better tank conditions. If you use a wet/dry filter sump set up like me, you will absolutely love the flow this pump puts out. There is a 5 year warranty on all non moving parts on the Mag Drive 500 gph pump. The impeller and motor however are covered by a lesser 1 year warranty. Additionally this one year warranty does not cover damage caused by user error, running the pump dry or excessive build up. While this may sound extremely limiting, you shouldn’t run into any issues if you clean the pump every month or two. Owners of the Mag Drive 500 can expect over 5 years of lifetime from this pump. In that lifetime you will likely need to replace the impeller at least once, which costs around $15. For strong reliable flow, I am more than happy to replace a broken part or two. Remember: if you are instead choosing a larger model that does not have the flat base, you will be getting a ceramic shaft. Those break far more frequently and cost much more to replace. The 700 is the largest magnetic impeller model available. The mag Drive 350 GPH utility pump is a bit pricey for the gph it delivers. It does however come with a more reliable impeller than larger models while also pushing more water than advertised. The Mag Drive can be a bit of a noisy pump, but is fairly easy to quiet. 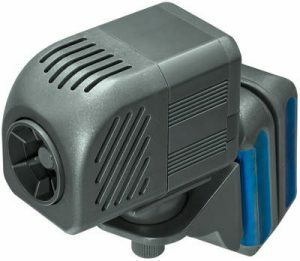 Overall it’s a great pump, however I would recommend the 500 model instead if you can handle the water flow. There isn’t a whole lot to do when setting this pump up. You will need tubing to fit the 1/2″ FPT inlet and 1/2″ MPT outlet. You can also choose to install a throttle valve so that you can control the flow of the pump. The base of the pump is a simple flat stand. It is quieter than the larger models, which ave absolutely no stand. As these pumps can cause a fair amount of noise you may want to place a rubber mat underneath the pump. You can even take it a step further, following Tunze’s practice, and use four separate rubber mounts. This is how I keep mine indoors without driving the family crazy. Submerging the pump will make it quieter, while also removing the need for a second tube. The problem here is heat generation. Mag Drives are a bit infamous for raising the waters temperature a few degrees. In hot climates like mine that can be an absolute deal breaker, which is why my pump runs externally. Finally the cord is a solid 10 feet which lets you place the pump virtually anywhere. Mine sits right next to an outlet, but not so close that it could spray water should a hose get yanked on, and therefore has most of the wire tied together. Mag Drive has a nice and easy to use design. The front of the pump comes off via 4 screws on the front of the pump. With this part removed you can clean out the pump and impeller. Remember: The impeller and mount are both magnetic and must be treated with care. Any and all scratches will almost certainly doom the impeller. Replacing these costs about $15. Use soft materials to avoid this. If there is a lot of build up on the impeller and you cannot get it off without force, try soaking it in a mixture of 50% water and 50% vinegar. This will remove most of the gunk. After that you can wipe it off with a cotton swab. I like using those as they can scrub somewhat hard without damaging the impeller. The rest of the pump can be cleaned with vigorous scrubbing. Do not use any materials that have seen chemical use, as this can easily harm fish. The flow on this model is well above advertised. This is generally true for the small Mag Drive pumps, though this model seems to get the most extra power. Note: 7 feet is much taller than many aquarists need. Measure your planned set up and ensure you are not getting too much pump. If you have inadequate draining this pump can easily cause flooding/water damage. Because this pump has so much power, you may need to give it multiple exits for smaller tanks. Doing so will make the flow much more gentle and reduce any splash back. Mag Drive pumps come with a 5 year limited warranty. This covers all non moving parts including the filter and accessories. The impeller and motor are covered by a separate warranty that lasts for a single year. It does not cover damage caused by excessive build up, running the pump dry or any user error. This is a bit annoying, as the impeller is the most frequently damaged part. Thankfully it isn’t too expensive to replace once the warranty ends. On average Mag drive pumps will last between 5-7 years. If you keep the intake clean, reducing the stress on the motor, and don’t mind replacing the impeller the pump can run for over a decade. The Mag Drive 350 gph certainly provides great value per year, provided you treat it right. 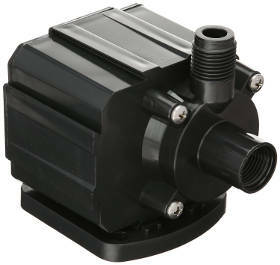 Supreme’s Mag Drive 2400 gph utility pump is one of the most widely used pumps available. It is extremely dependable, moves a ton of water even with high heads and is a cinch to clean. The price is a bit up there, but at this gph it’s hard to find a good alternative. On the other hand there is almost no reason to avoid this pump. Setting up the Mag Drive 2400 gph pump can be as simple as connecting it to some tubes and dropping it on the floor. There really is absolutely o extra features to worry about that other pumps often tack on. The cord is a solid 10 feet, allowing free placement of the pump. The only case I’ve found this to be short is when using it for my backyard pond. I didn’t need any flow there but I thought it would be cool to try this pump on. If you are using the pump out doors ensure the cord is enough for your needs. Otherwise you will need to look into safe extension cords. The inlet is a 1″ female pipe thread while the outlet is a 1″ male pipe thread. Make sure to get your tubing accordingly. Note: The Mag Drive 2400 runs louder than most pumps. This is mostly because it has no support system. The pump simply rests on whatever surface you choose. For my pump, which is used externally, I use old rubber coasters. One per corner has drastically reduced the noise factor. Remember even outside ponds are better without noisy pumps. Always do your best to ensure a less disruptive pump. The design of the pump is fairly straight forward. The motor is housed in the back of the pump, holding the impeller in the middle while the inlet forms the front of the pump. The pre-filter is an add on item, which you will only be using for fully submerged pumps. The front of the case comes off by unscrewing the 6 screws. To clean the pump you will need to remove the front cover and impeller. Place the impeller in a mixture of 50% water and 50% vinegar while you clean out the pump. It should be left in the solution for no less than 15 minutes. The body of the pump should be wiped clean, including the impellers housing. Remember to be gentle on the interior of the pump. Additionally ensure there is little to no build up in the screw holes. While not a huge issue it is nice to prevent them from sticking to the body. Rinse off the pump and impeller with freshwater(no salt!) and reassemble the pump. Reconnect all the tubing and ensure they are secured before restarting the pump. The pump should be cleaned every 1-3 months, depending on what environment the pump is in. The more debris the more frequent the cleaning should be. This is why people choose this pump. Its gph, even at high heads, are quite powerful. There is no way to dial back the strength, so be absolutely sure you can handle the pump. There is no coverage for water damage with this pump. My only issue here is the flow with no head. It is well below what is advertised. Once the water does begin to climb however, it should outshine any other pump. The Mag Drive 2400 gph utility pump comes with a 5 year limited warranty. This covers all non moving parts such as the body, filter and accessories. The moving parts like the impeller and motor are given a shorter one year warranty. This is another issue, as the impeller is by far the most frequently broken part of the pump. Replacing the impeller for smaller models isn’t too expensive, however this big pumps impeller costs between $50-$80 depending on where you find it. Keep the impeller clean to increase its lifetime. The pump itself, minus the impeller, will often see well over 5 years of lifetime. If you can keep the impeller clean, with little to no stress it can also live quite a long time. Replacing the impeller is much cheaper than buying a new pump, however you should consider adding one impeller to the cost of this pump, as you will likely need at least one. The Seio P530 Prop Pump is a middle ground powerhead, placed between maxi-jets and Tunze in terms of quality. It provides excellent flow and distributes it over a great area. This makes the current very gentle, supporting slow swimmers and slow current corals. While Rio does distribute this powerhead, it does not suffer the constant failures that Rio pumps are known for. This is because Rio does not actually make the pump, they just distribute them. Setting this pump up has been one of the easiest so far. Simply slide off the front cover of the powerhead, then slide the magnetic mounting bracket into place. Then slide the front cover back into place and you’re ready to mount the powerhead. 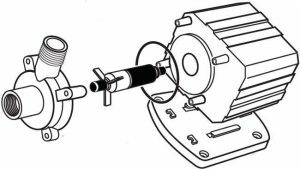 As with all magnetic powerheads you will want to slowly bring the magnets together, with the aquarium glass between them. For the easiest time put the two magnets against the glass but in different areas. After that you can slide them together so that there is no chance of impact against the glass. The magnets work on glass up to 3/8″ thick. When starting the powerhead you will hear a fair bit of rattling followed by a quiet hum. The Seio is a rather quiet pump over all, but this rattling fixes any and all reverse runnings. That being said the Seio P530 is not made to be turned on frequently and should never be used as a wave maker. This will drastically shorten the lifespan of the impeller, not to mention be much nosier than anyone would want. 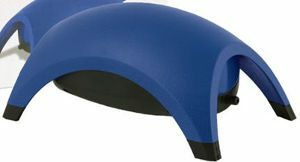 The Seio P530 is well covered, ensuring even the slowest of swimmers do not get pulled into the powerhead. This is one of the benefits a square shape has on the powerhead. While the Seio P530 is small it’s a bit more difficult to hide in the tank. As a final note the cord is a generous 6 feet long, allowing fairly free placement of this powerhead. The main restriction on depth is actually the venturi air injector. The provided tubing is rather short, and will only work when the powerhead is just a few inches underwater. impeller can be unreliable. If the powerhead stops working check this first. The Seio certainly takes awhile longer to take apart and deep clean than most powerheads, but it is none too difficult. 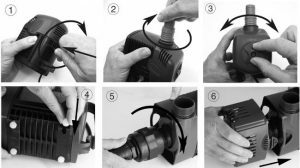 First you will want to unplug and remove the powerhead from the aquarium. You can either remove the magnetic mount with it or partially disassemble the powerhead underwater, which is how I choose to do it. With the Seio out of the water you will need to remove the front cover and unscrew the well cover lock nut. After that you need to remove the impeller well cover, prop impeller and ceramic shaft. The impeller and shaft should be cleaned using a 50/50 mixture of water and vinegar. You can just leave these soaking for 15 minutes or so. wipe it down with a soft material that has not been used with chemicals to remove any remaining debris. You can use the 15 minutes of soak time to either scrub the grate clean or pick out any large debris. I like to leave the coralline algae on my powerhead, but it can make the front grate harder to detach next time. Reassemble the powerhead in the reverse order and resubmerge it in the tank. Rotate it to let out any air before turning it back on. The flow speed is not adjustable, and the output is already very well distributed. I highly advise against diffusing the water unless you are keeping very slow swimming fish in your aquarium. The direction of the powerhead is limited to only 160 degrees, but the magnets can be turned to give you a full 360 degrees. If you are turning the magnets be sure to turn both at the same time. The Seio P530 comes with a decent 6 month warranty, which will cover the majority of failures and faulty parts. The main culprit of these failures is the impeller, which can either come loose or simply break. Even after warranty it is much easier to custom order the part instead of replacing the entire powerhead. As mentioned right at the beginning this pump is not made by Rio and will last much longer than Rio pumps. Provided the impeller does not break ahead of time, you can expect a range between 2-6 years from the average Seio P530. Over all it’s a good lifetime for the price. Seio’s P320 prop pump is a decent pump but suffers a bit when produced in this small size. The ceramic shaft, one of the drawing features, is a bit too brittle when this small and can break after frequent use. Otherwise the powerhead performs well and is fairly quiet. Because the shaft is more likely to break I highly recommend you hop over to my Tunze 6015 powerhead review. It costs a bit more but you’ll get a whole lot more bang for your buck. The little Seio P320 is quick and easy to set up. Simply pull off the front grate, slide the magnetic base into place on the bottom of the powerhead and reattach the front grate. Ready to install. These magnets are strong, but not too strong. They can hold on glass up to 1/4″ thick. Keep a firm grip on both magnets when placing the powerhead. Ideally you will hold the powerhead against the glass on the inside of the tank while brining the exterior magnet into place. For the safest method you should bring the exterior magnet to the glass above its final resting place. After it is touching the glass you will want to slide the magnet down. This removes the risk of the magnets jumping together, crashing into the glass between them. The cord is 6 feet long, which is really generous for the tanks it’s meant for. Honestly you will likely leave some of it coiled up behind the tank. The box like shape is a bit difficult to hide, even with how small the powerhead is. The box shape does, however, allow it to more evenly distribute the water. This often leads people to believe Seio brand powerheads don’t move as much water as listed. They do, but it just feels weak as it is over a bigger area. Once the powerhead is switched on you will hear a fair bit of clattering before the pump switches to a near silent hum. This is the impeller finding its place in the motor. Due to the small size the ceramic shaft can break more easily than most models. Try to start up the powerhead as few times as possible, as the clattering stage is the main time when this will break. The body features many small grates which are too small for any fish to enter but not so small that they inhibit the waters flow rate. For assembling and disassembling, this powerhead takes a bit more work than most. You will need to start by removing the powerhead from water. Remember there is an external magnet attached to the powerhead. Put this somewhere where it won’t cause any trouble. With the powerhead out of the tank, preferably over a sink to catch all the hidden water(towels are never enough), you will need to remove the main housing and well cover lock nut. Removing these exposes the impeller well cover. After removing the well cover you can clean out the impeller, ceramic shaft and mount inside the powerhead. These are the key areas to clean, as they are the main source of powerhead failures across most brands. With Seio’s ceramic shaft they are well up there on this danger. To clean the impeller and shaft you will need to soak them in a solution of 50% water and 50% vinegar for no less than 15 minutes. After this time you can wipe them clean using a soft material. I prefer to use cotton swabs, as they never have any chemicals on them and are easy to keep on hand. Rinse off the components and reassemble the powerhead in reverse order. Return it to the tank and remember to be careful with those magnets! The flow rate of the Seio P320 cannot be adjusted. Furthermore it is almost sure to break if you try and use it with a pulse or wave maker controller. Just do not even try it. Even successful set-ups will create a lot of noise each time the powerhead switches on. The direction can be set within a 160 degree arc by turning the head. The powerhead can be adjusted further by turning the two magnets that are holding it in place. Remember: The flow on this unit is much more distributed than the average powerhead. Aiming it slightly downwards can cause a sandstorm. Start out with the powerhead facing straight forward and fine tune it. Seio provides a decent 6 month warranty on the P320 prop pump. This will catch most faulty units, as the main culprit is broken on arrival ceramic shafts. Remember to inspect the powerhead during its final month of warranty and ask Seio any questions you could have. Once the warranty ends you will need to complete a form to custom order extra parts. The lifetime on this powerhead varies with two things: luck and care. I cannot stress enough how risky the ceramic shaft is when created this small. The other units hold up just fine but this model worries me too much to recommend. When the shaft does not break and the powerhead is well cared for it can easily live between 2-6 years. Overall it’s a pretty good pump, but I personally would spend a bit more for a Tunze. Now those are powerheads you can count on for over a decade of service.